Found this in the drafts. Steve is sweet but not mushy sweet. He’s not the kind with awesome well-planned surprises. He will just surprise you the simplest way he could or maybe even not, but that’s the way he is. Anyway, the proposal happened on my birthday, while celebrating at my friend Paulo’s house, I was eating chicken from a YellowCab delivery with my hands and there he knelt and asked the question. So I was there, sitting and dumbfounded, asking if he’s serious and immediately looked at my greasy fingers and figured how would he put that ring with my hands all greasy?! Oh well, so he did and I said Yes. He looked nervous alright because he intended to actually ask while celebrating at the house with most of his siblings around. Guess his shyness got the better of him. The ring is really pretty, not your typical one stone white gold ring. I was surprised that it was gold and had little stones on the side. Steve said he designed it himself. Though the actual diamond is smaller than a karat, it was just appropriate for me to wear in the Philippines, not too flashy but still elegant. I love it! 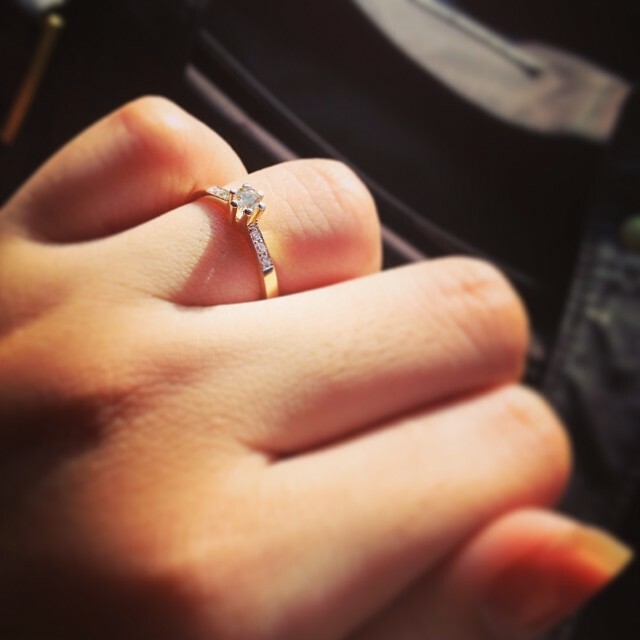 Never in my life did I think I would be engaged, let alone get married someday. I always pictured myself growing old single, an old maid or probably have a child from a failed relationship then struggling to survive and put my child to school or travel if I didn’t have any child but have a good enough career and then live with lots of dogs. Truly, God wants my life the other way around. Instead, I got into a long term relationship and here we are engaged to be married. Certainly He gave me much more than what I expected my life to be. God blessed me so much to actually have a normal life, not the kind that still turns heads one way or the other. I know there will be struggles along the way but I’m sure glad to have someone and be someone’s other half so we can get through life’s ups and downs. Celebrate life and be each other’s wall when things don’t go as well.